At first glance this is a pretty standard negative review. But - and this is what turns it into a 'killer' review - it is the only review of the business operating in an intensely competitive market (lending) and the review has been viewed over a thousand times since it was posted a year ago. 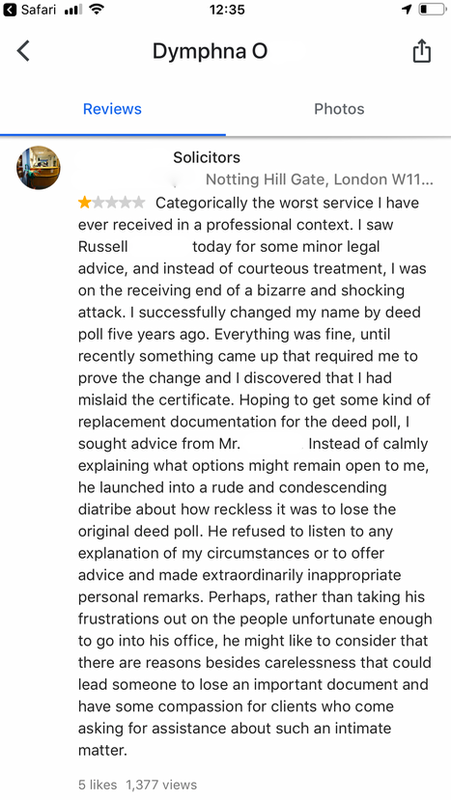 This review is convincing and well-written (two major criteria if a review is to have impact) but most important of all it has been viewed by nearly fourteen hundred potential clients (no one idly browses reviews of solicitors). It will have deflected enquiries and, crucially, it will continue to do so for the foreseeable future. At the very least the business should have responded to the review setting out its defence. Estate agents, as we all know, are hardly the most popular business on the block, so negative reviews are to be expected, so what makes this particular review significant? 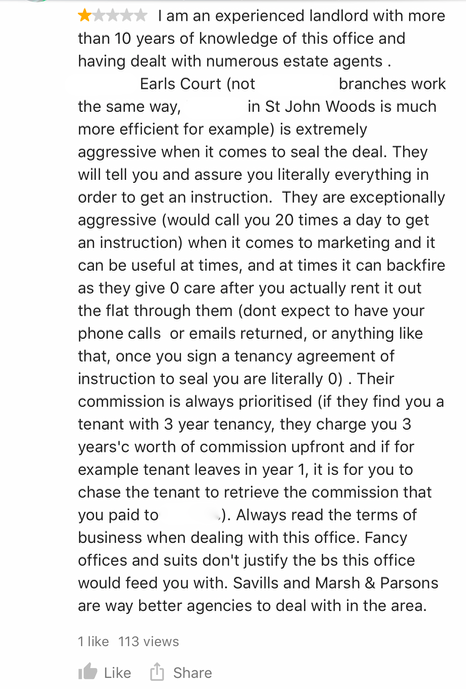 The first point to make is that the review is written by a fee-paying client - a landlord (many, if not most, negative reviews of estate agents are written, often unfairly, by disgruntled tenants). Other potential fee-payers will take note. Again there is convincing detail in a well-written review. More damaging still: the reviewer had recommended direct competitors that can be found a click away. The review may be true, it may contain inaccuracies, it may be written by a competitor or even a disgruntled ex-member of staff. One thing is for sure - and we have ten years' experience to back up this contention - is that it is very unlikely that the business that is subject to the review will be successful in having Google take the review down. But the overwhelming majority of reviews won't qualify* - they will fall under what Google defines as a 'commercial dispute' and Google will not intervene in such disputes. So what should the business do? *If in any doubt, call us. We will be able to tell you within minutes. First: flag the review to Google. You never know, we have seen examples where flagging has worked, even though the review didn't contravene Google's rules. Remember that Google has a mine of information on the reviewer, and we suspect they check for unusual patterns of behaviour. Never disclose confidential information - even if you think doing so will bolster your argument. No-one considering using a business wants to use one that published details of a person's financial situation. An example we often see is estate agents, when being criticised by prospective tenants because they have lost out on a property, disclosing that the applicant failed one or more financial tests. Bear in mind that your response will be read by everyone and anyone reading your reviews, now and for evermore. You will need to respond to the person who wrote the review and the many who will read your response. Once all of this has been done it will be time to sit back and take a long hard look at your review management policy. What is my business's Google score? How many reviews do we have on Google? What percentage of our reviews rate us five stars**? **in the weird and wonderful world of Google a four star review, viewed on its own, may look fine, but in practice it will have the effect of adding to the weight of your three, two and one star reviews to chip away at your overall Google score, which must be maintained above 4.4 to pass the Google reviews filter. Must be maintained at 4.5 or above to pass the Google filter. That means, in simple terms, that nine out of ten of your reviews, whatever their content, must rate you five stars. Of course your should aim for a perfect score of 5.0 on Google (with all of your reviews scoring you 5 stars) and some businesses do achieve this (we have half a dozen clients in this enviable position) but most businesses - and some customers - will make mistakes, it's only human. Consumers will allow for this, but Google will not. If the percentage of five star reviews your business has drops below ninety-five - give or take the odd four, three and two star review - your will fail the Google filter. And if one or two of those one star reviews are the above-mentioned 'killers' you will need to take urgent remedial action. Where does HelpHound come into all of this? To be sure that your business stands the very best chance of preventing factually inaccurate or misleading reviews making it into print - on Google or anywhere else (Trustpilot, for instance) - we advise every business to host reviews on its own website and only then invite their customers to copy their reviews to Google. HelpHound clients benefit from independent moderation. This means that every review is read and checked for potential mistakes pre-publication. If any are found we refer to both reviewer and business. This service is not only popular with businesses but also with reviewers; most sensible reviewers write reviews to help fellow consumers and they don't want inaccuracies published any more than the business under review does. What HelpHound does not do is aid and abet gating. Gating is where the business pre-qualifies those customers that are most likely to write a five star review - by sending an email or inviting a review to a less visible reviews site - and then only asks those that have proved their intention of rating the business five stars to write a review to Google. Let us be quite clear about this: gating is a) illegal in the UK and b) against Google's terms and conditions (Google will delete every review for businesses it catches gating - here's more on that).